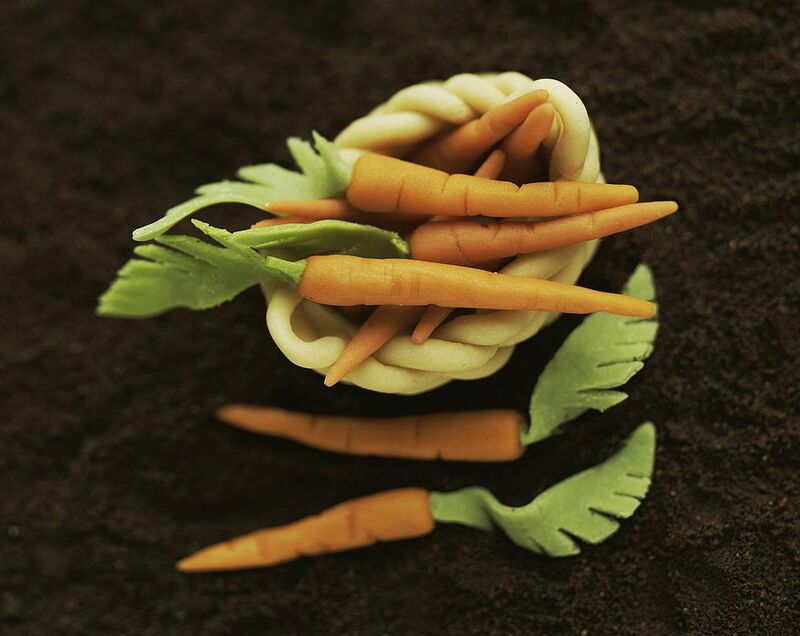 Marzipan carrots are easy to make, and look adorable on top of carrot cake or cupcakes! You can modify the recipe and vary the size of the carrots to suit your needs. You can make your own marzipan, or purchase it from most large grocery stores. Marzipan most commonly comes in 7-ounce tubes (the quantity called for here) but you can use more or less depending on what you have available. 1. Coat your hands with powdered sugar, or wear plastic gloves. 2. Knead the marzipan until it has softened slightly. Flatten the marzipan into a disc, and add a few drops of red and yellow food coloring to the middle, using a ratio of 1 drop red to 2 drops yellow. Fold the marzipan into a ball and begin to knead the color throughout the dough, adding more food coloring if desired, working until the marzipan is one uniform color. 3. Roll the dough into small balls the size of a quarter. Roll the balls between your palms, elongating them into thin tubes and tapering one end, so that they are shaped like carrots. 4. Take a toothpick and, holding it perpendicular to the carrots, make horizontal indentations all along the length of the toothpick to create slight creases. 5. If desired, poke holes in the tops of the carrots, and insert the sprigs of herbs to be the carrot leaves. 6. Store marzipan carrots in an airtight Tupperware container for up to two weeks, or freeze well-wrapped marzipan carrots for up to three months.